AVF5% - Permanent AVF Member Discount. As the code suggests it gets you 5% off your order. ckane, cruzmiguel, Smash and 4 others like this. Last edited by Knoxie; 25-08-13 at 08:30 PM. To celebrate World Vaping Day we would like to offer you all the discount code "WVD2013" which will get you 13% Off your order. It will start tomorrow (Australian Eastern Standard Time) and last for 2 days. This should allow for the time difference for our friends in other countries. If you have a vape meet or event planned, have fun and celebrate a healthier lifestyle. BrianS, luntingsir and dhans like this. just tried the code, and it didn't work. not fussed at all, just thought i'd let you know. Yeah, got sick of the code and have been playing around with a loyalty program. ah. fair enough. loyalty program looks good too. Hey Ben, when i enter the discount code it says 'Unable to find a valid discount matching the code entered'. Is it no longer valid? Are your eyes painted on? ckane, bobbavet and Wantonnoodles like this. 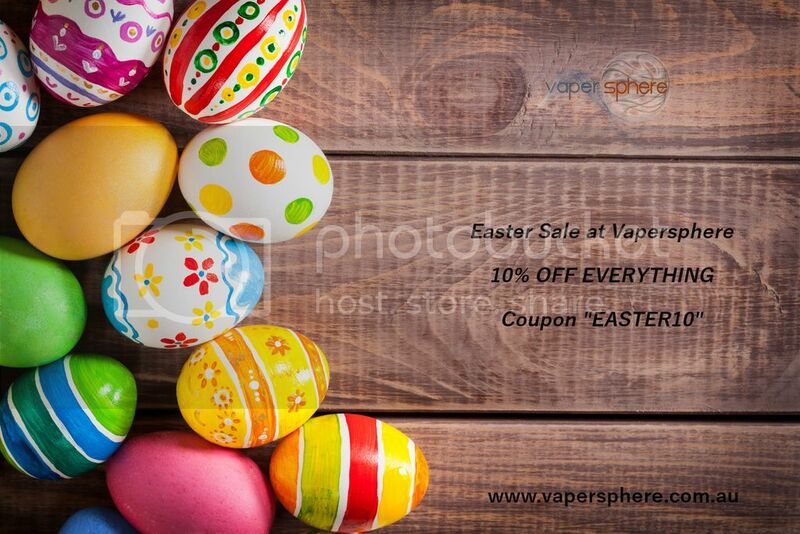 Coupon "EASTER10" enables 10% OFF all products. Valid until Tuesday.